It’s that day again when I shuck my cynicism, sadness, anger, and generally depressed nature to look for the shiny chestnut. 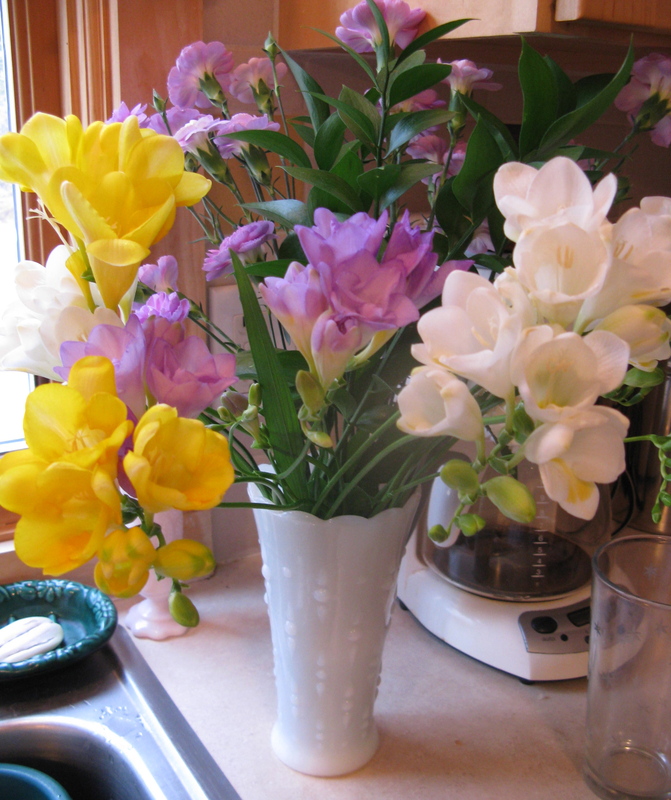 The locally-grown freesia that I bought at the store and which is in a vase on my kitchen table. The smell is one of my favorite flower smells and when I used the self-cleaning feature of my oven last night, I just popped my nose into the freesia and I was given a brief respite. The heavenly scent has been fleetingly filling my kitchen all week. The vase that the freesia is in. It’s a white milk-glass vase with sort of a hobnail, but not exactly hobnail, pattern. I got it a few weeks ago at the local Salvation Army. I love milk glass. I especially love the pink milk glass vase I have. It is patterned with raspberries. I love that I just googled “history of milk glass” and pulled up all kinds of information–history, items for sale, photos.